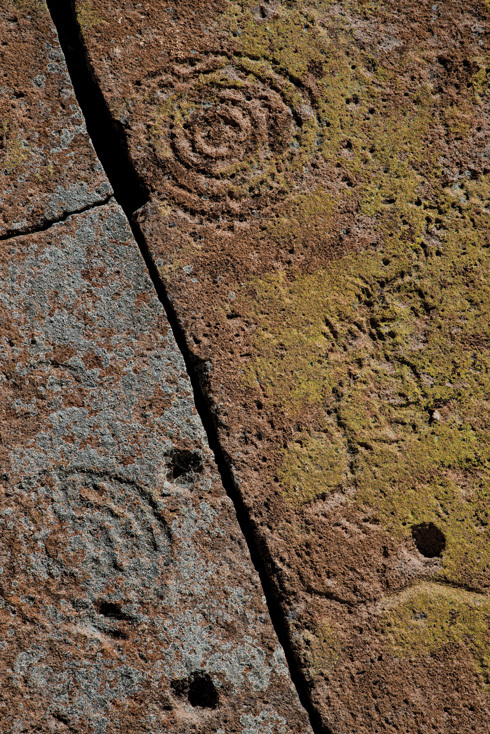 Photographer David Halpern expanded his vision with one of the most enviable gigs in New Mexico: artist-in-residence at Bandelier National Monument. Above: Cavates, North Wall of Frijoles Canyon, 2014. IHAD TURNED 77 and figured my days as a national park artist-in-residence were behind me. I’d been lucky enough to earn 11 such postings, enabling me to wander the backcountry of places in Utah, Colorado, Montana, and Maine, exploring them through my camera lens. But in 2013, Jason Lott, superintendent of Bandelier National Monument, asked me to create an artist-in-residence program for his park. The upshot? While creating the program, I also got to serve as its first artist. Working primarily with Chief Ranger Tom Betts, I spent all of 2014 building both the program and a great friendship. I began to photograph in areas that were completely new to me, though I had been to the park many times before. For four weeks I lived and worked in the park, and throughout the year I had unlimited access, visiting as I wished from my home in Santa Fe, just an hour away. Sound like a dream job? In a way, it is. But it serves several important purposes. Professional writers, composers, and visual and performing artists—chosen by a jury of arts professionals with diverse expertise—get an opportunity to pursue their disciplines in an inspiring environment. At Bandelier, they stay in a historic, Pueblo-style residence. But there’s no stipend, food, or materials allowance; the residency is an unpaid opportunity. In return, the park receives some portion of what the artists create, including a limited shared copyright. The artist also agrees to provide a public program. For me, that meant leading four photo hikes during what turned out to be a very busy year. On top of my month living in the park, I made 24 visits to Bandelier and several trips to the nearby Valles Caldera National Preserve, where I was also granted access. Now that I can count 12 national-park residencies among the 50 parks I have worked in, I assure you that the opportunities are extraordinary and well beyond those normally experienced by visitors. You’ll see some of that in the photographs contained in this 2014 portfolio, just a small fraction of the total from my residency. Every artist will see Bandelier differently, and I saw it as very different from all of the other parks. 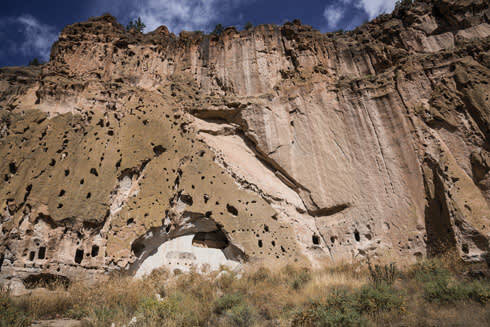 To begin with, Bandelier is noted more for its archaeological, geological, cultural, and historical significance than for its scenic grandeur. It is beautiful, but its archaeological sites can be hard to spot, either because they’re largely buried or indistinct ruins. In contrast with Mesa Verde and Chaco Canyon, it’s fair to say they’re mostly less picturesque. Geologically, it’s a treasure trove, but you need to know something about geology to appreciate it. Culturally, there is much to learn, for it has served as home to the ancestors of today’s San Ildefonso, Santa Clara, and Cochiti people. Building those bonds takes time. I have always found it useful to begin with an understanding of the landscape, history, and residents of the places I work in order to give my photographs meaning. Bandelier requires me to study constantly, and there is still so much I do not know. By the end of this year, Bandelier will have hosted a total of seven very talented artists of diverse media, including photography, oil and watercolor painting, drawing, poetry, journaling, and storytelling. I feel great satisfaction that I helped open a door for them to experience the park as I have. —David Halpern is featured in “Storytellers”. Interested in becoming one of Bandelier National Monument’s 2017 artists-in-residence? Park officials will issue a call for applications late this year. Keep an eye on the park’s website and Facebook page for details.